With joy and gratitude, the Sinsinawa Dominicans announce our newly elected prioress and council as we set out anew together! 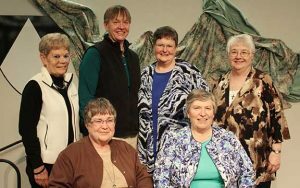 From left: Sisters Colleen Settles, Toni Harris (prioress), Elizabeth Pawlicki, Patricia Beckman, Pamela Mitchell (vicaress) and Angelo Collins. As Sinsinawa Dominican women, we are called to proclaim the Gospel through the ministry of preaching and teaching in order to participate in the building of a holy and just Church and society (Mission Statement). The leadership team includes Prioress-elect Antoinette “Toni” Harris, OP, and Councilors-elect Pamela “Pam” Mitchell, OP (Vicaress); Colleen Settles, OP; Elizabeth “Betsy” Pawlicki, OP; Patricia “Pat” Beckman, OP; and Angelo Collins, OP. They will be installed June 2016. They bring a wealth of knowledge and willingness to serve their congregation. Sister Toni previously served as prioress of the congregation, 2000-2006, followed by nearly seven years with Dominican Sisters International as international promoter for justice and peace. Sister Pam, an attorney, is a councilor on the current leadership team who will finish their five-year term in June. Sister Colleen serves as vice president of mission at Providence Saint John’s Health Center and John Wayne Cancer Institute, Santa Monica, Calif. Sister Betsy is an attorney with the Illinois Education Association, an affiliate of the National Education Association. Recently retired from 45 years of ministry in Catholic education, Sister Pat has been taking classes and volunteering in Sturgeon Bay, Wis., at St. John Bosco Catholic School, where she was principal. Sister Angelo ministers as associate dean in the School of Education and Counseling Psychology at Santa Clara University in California. The Sisters thank all those who held them in prayer during their Chapter. Sinsinawa Dominican Sisters live and minister in your diocese. They invite you to learn more about our worldwide Dominican family, the Order of Preachers. For over 800 years, Dominicans have continued to preach the Gospel in word and deed. Today, thousands of sisters, nuns, priests, brothers, associates, and laity minister in more than 100 countries around the world. Visit our website at www.sinsinawa.org.